LODs are loaded and cleared in accordance with corresponding distances specified in the Node tab. These distances are to be used to avoid delays and provide smoothness when switching between LODs as well as to ensure efficient memory use. 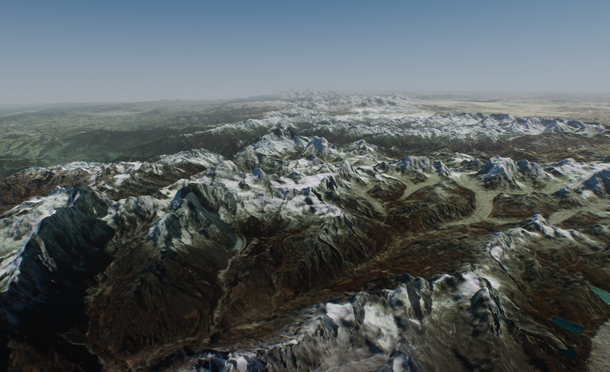 In this case masks are generated only for the tiles marked with M.
Global terrain parameters can be adjusted on the terrain's Node tab in the Parameters window. Each data layer contains a list of LODs with corresponding parameters. Parameters of a certain LOD of the height data layer can be accessed via the LODs section of the Node tab in the Parameters window. You can add a new height or remove an existing one by clicking or respectively. Added heights can be toggled on and off by using checkboxes inside the Height window. Parameters window, Node tab, LODs section. Intersectable — toggle intersection detection for the current height LOD on and off. 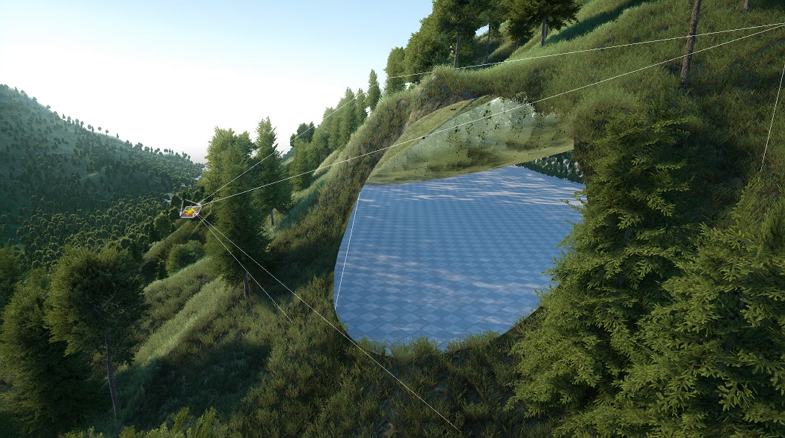 Collidable — toggle collision detection for the current height LOD on and off. Cast Shadow — toggle shadow casting for the current height LOD on and off. You can use this parameter for performance optimization: disable shadow casting for high-poly LODs and enable for low-poly ones. 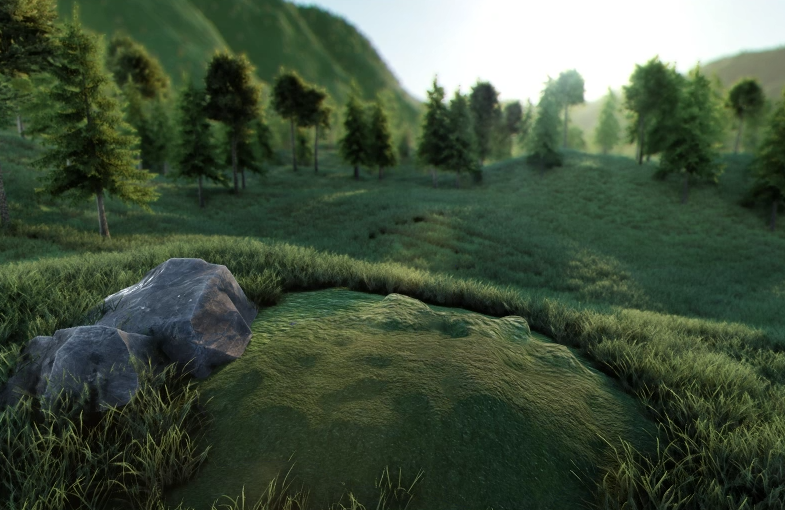 When only the low-poly LOD casts shadows, the high-poly LOD may be shadowed in areas where it shouldn't be. To reduce this effect, use the Shadow Offset parameter of the terrain material. Viewport — viewport mask for the current height LOD. 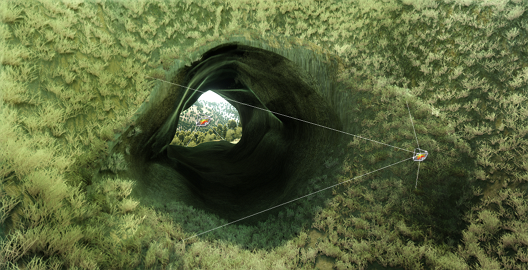 Intersection — intersection mask for the current height LOD. Collision — collision mask for the current height LOD. Path — path to a folder, in which the current height LOD is stored. Visibility distance — the distance starting from which the tiles of the current height LOD become visible. Load distance — the distance starting from which the tiles of the current height LOD are loaded into memory. Clear distance — the distance starting from which the tiles of the current height LOD are removed from memory. Video memory usage — memory consumption of the current height LOD. Parameters of a certain LOD of the albedo data layer can be accessed via the Albedo section of the Node tab in the Parameters window. You can add a new LOD or remove an existing one by clicking or respectively. Added albedo layers can be toggled on and off by using checkboxes inside the Albedo window. Parameters window, Node tab, Albedo section. Visibility distance — the distance starting from which the tiles of the current albedo LOD become visible. Load distance — the distance starting from which the tiles of the current albedo LOD are loaded into memory. Clear distance — the distance starting from which the tiles of the current albedo LOD are removed from memory. 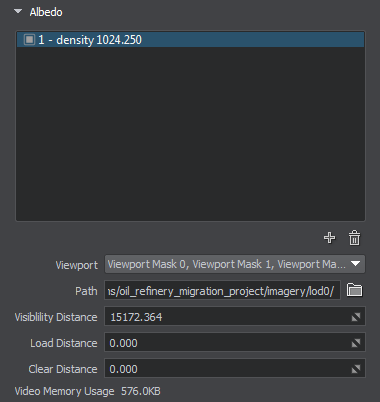 Video memory usage — memory consumption of the current albedo LOD. Parameters of a certain LOD of the normal data layer can be accessed via the Normals section of the Node tab in the Parameters window. You can add a new LOD or remove an existing one by clicking or respectively. Added normal layers can be toggled on and off by using checkboxes inside the Normals window. Parameters window, Node tab, Normals section. Viewport — viewport mask for the current normal LOD. Path — path to a folder, in which the current normal LOD is stored. Visibility distance — the distance starting from which the tiles of the current normal LOD become visible. Load distance — the distance starting from which the tiles of the current normal LOD are loaded into memory. Clear distance — the distance starting from which the tiles of the current normal LOD are removed from memory. 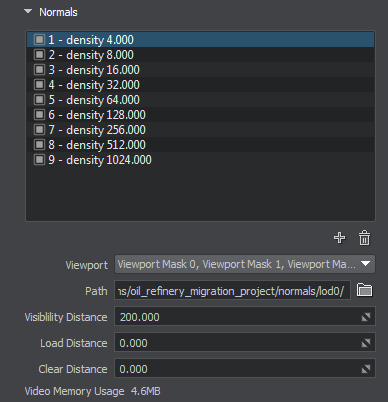 Video memory usage — memory consumption of the current normal LOD. Parameters of a certain LOD of the masks data layer can be accessed via the Mask section of the Node tab in the Parameters window. You can add a new LOD or remove an existing one by clicking or respectively. Added mask layers can be toggled on and off by using checkboxes inside the Mask window. Parameters window, Node tab, Mask section. 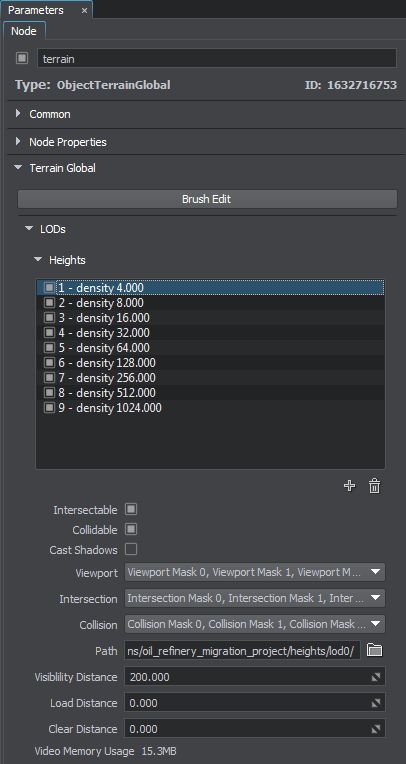 Viewport — viewport mask for the current masks LOD. Path — path to a folder, in which the current masks LOD is stored. Visibility distance — the distance starting from which the tiles of the current masks LOD become visible. Load distance — the distance starting from which the tiles of the current masks LOD are loaded into memory. Clear distance — the distance starting from which the tiles of the current masks LOD are removed from memory. 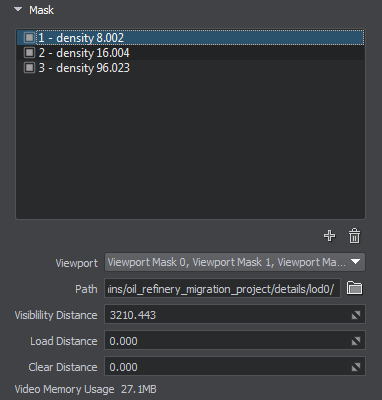 Video memory usage — memory consumption of the current masks LOD. 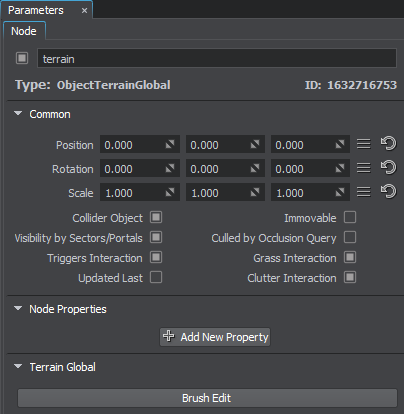 To start editing the current terrain, click the Brush Edit in the Terrain Global section of the Node tab in the Parameters window.